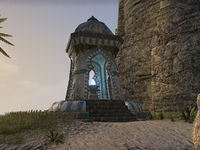 Sandy Grotto Wayshrine is located on the northeastern-most point of Stros M'Kai. A small cave containing Siraj's corpse is nearby, and a chest can also be found on the coast west of the shrine. It is on the northern-most area of a small island in northeast Stros M'Kai, and is the only place of interest in this island, aside from a few fishing holes in the river separating the island from the main island.